I'm finding that the math does not work for a stock height XJ. I see your photos and the bar appears to be perfectly installed. What size lift does your XJ have? (Update) The stock WJ downlinks allowed me to mount the bar into my stock height XJ, at least to test it. The lever part of the bar is not horizontal, but works for a test. I did not drill the hole, just used the one bolt per side for this test. After all is said and done, this bar performs about the same as a ZJ bar, which I have also installed. It's thicker than the ZJ bar but the lever part is two inches longer, so the net effect is: this bar is not stiffer than the ZJ bar in application. The ZJ bar bolted right into the XJ mounting position, no drilling of holes or cutting brackets. So, future modifiers, both a ZJ and the thicker WJ bar perform identically. Fielder's choice. If you choose the WJ bar, the WJ downlinks bolt right in and are appropriate for a slightly lifted XJ. I'd find shorter downlinks if I was going to keep the WJ bar in my stock height XJ. This is not true at all. If you actually did the math you would find that the WJ bar does infact induce less body roll. The WJ bar actually uses a thicker walled bar as well. The extra length was factored in for the smooth transition of weight transfer on the WJ. A WJ with a V8 and quadradrive weighs 500lbs more then a V8 4x4 ZJ. The WJ has less body roll then a ZJ, and handles MUCH better with a similar front suspension, and axle setup. So if you are going to make claims about "MATH", then please use facts to back it up. As far as the performance is concerned, I experienced over and 2 inches less body roll going to a WJ bar from a XJ bar. I measured this with a ZJ bar I had lying around after your post, and it was still over an inch less then the ZJ bar. This is a great upgrade and I recommended it to all with a lift. Most people, if any, are NOT installing this mod on a stock height XJ. You are entitled to your opinion, but please back up your claims with facts. I actually measured my body roll. Last edited by trans_am7935; 06-12-2017 at 03:18 AM. I agree that this is a great way to modify a Cherokee for better handling. The math I was referring to was the drop link length. A XJ has 3 inch and the WJ bar has 6 inch drop links at stock height. If the lever portion of the bar is not horizontal then a comparison of the bars is difficult. You have a lifted XJ and use custom drop links, so you can achieve a proper install. My point was about a stock height and using the stock drop links, i.e. the cheap way. Now about your tests. The bars are all solid, there is no thicker walled bar here, just different bar diameters. You measured the body lean? That's funny. I can't imagine a scientific way to do that, at home. Your experience is that the WJ bar is twice as effective as the ZJ bar when used on an XJ. My experience is that they are nearly identical. I dropped the numbers for all three bars into this calculator. Of course by greatly increasing the front bar diameter and making no change to the rear bar, the Cherokee feels more responsive, but actually has more understeer at the limit of traction. As I drive my Cherokee on mountain roads near this limit, I will be increasing the diameter of the rear bar to bring the Cherokee back to more neutral handling. So far, I've only found expensive aftermarket bars available for the rear. Enjoy your ride, and thanks for the post. It enthused me to try the WJ bar even though my interest is stock height applications. 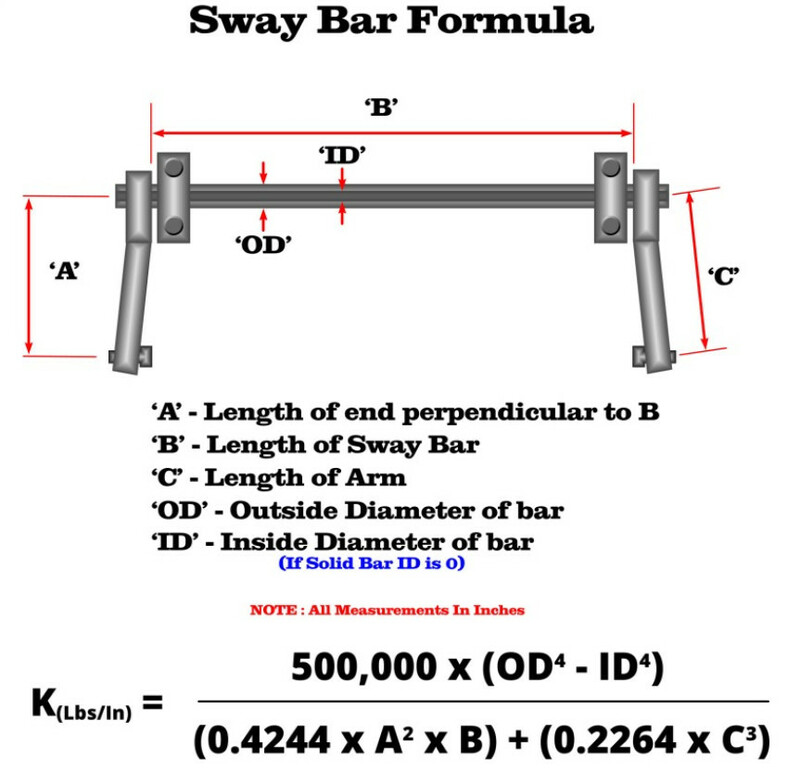 Screen shots of the Sway-Bar-Calculator are not included, as this is your thread. My point is to add some info about stock height considerations. I'm using the ZJ bar and liking it. (A) is the drop link length, and the assumption is that it is perpendicular to the lever, for this formula to give relevant data. Your photos show that your custom drop links and lever are are in this position, so the formula will give you accurate information. Last edited by [email protected]; 06-15-2017 at 07:32 PM. CherokeeForum Event at Hidden Falls Adventure Park July 22nd 2017!